I’ve told you before about mine and Mr. Scrummy’s very unhealthy addiction to fried potato wedges with sour cream and sweet chili sauce when we were living in Australia. We would go for a longish Saturday morning run, then somehow find ourselves perched on outdoor barstools stuffing our faces and ooh-ing and ah-ing over the deliciousness of the moment. We just might also have moaned a bit (oh OK then, a lot) about the paltry portions of sauce, and about having to pay if we wanted more. Cheapskates. I still dream about these moments, but alas, potato wedges at the pub aren’t such an institution here in the UK. I would make them at home but they’re just not the same if they aren’t fried to a deep crisp in a deep fat fryer. So what’s a girl without a deep fat fryer to do but find alternatives? A different kind of crispy fry! I realised that I’d found just that when I first had a go at making some ‘fries’ out of halloumi cheese recently. So what IS halloumi cheese anyway? Halloumi cheese has been breaking the Internet lately! But just in case you’re not familiar with it, it’s a hard white Cypriot cheese traditionally made out of sheep’s milk or goat’s milk – but now often made out of cow’s milk. It reminds me of mozzarella cheese, with its mild flavour, but you’ll find it quite a lot saltier. Halloumi is one of those cheeses that doesn’t melt when it’s cooked, which makes it perfect for frying to a lovely crisp. 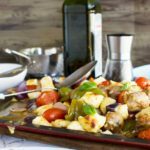 Where can I find halloumi cheese? This cheese is widely available here in the UK, and I really hope it is where you are so you can try these amazing ‘posh fries’. If you can’t see it in your regular supermarket, try a Mediterranean or even Middle Eastern deli. Enough of the rambling. How do you make halloumi fries? 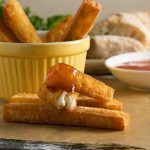 You’ll rarely (if ever) find anything complicated on this blog, but these crispy halloumi fries have got to be one of the easiest recipes of all. This is hardly even a recipe. Great news for fans of easy entertaining! After a few minutes (literally), you’ve got yourself a nice little stack of gorgeous crunchy, salty, cheesy fries. Yum! They look just like super crunchy regular fries, don’t they? I’m pretty convinced that fried halloumi cheese is one of the world’s tastiest, most addictive foods! 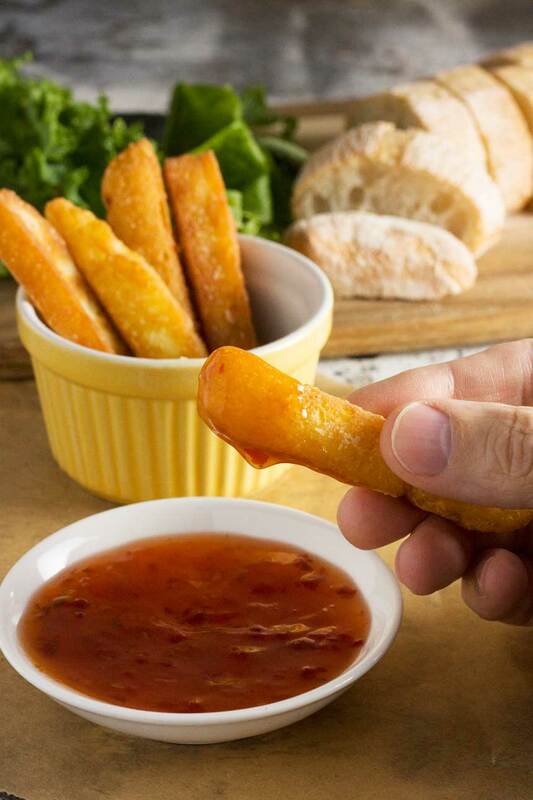 These are definitely best when piping hot, so don’t delay with your dipping. Use your cheesy fries to generously scoop up Greek yoghurt (or sour cream if you prefer) and sweet chili sauce … and enjoy! I’m thinking these would be great passed around with first drinks at a party over this holiday season. Dip, sip, and dip again. Mmmm! Scroll down to below the recipe to see the handy how-to video. 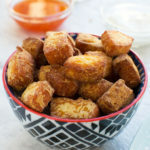 The video actually shows how to make my life-changing fried halloumi bites (perfect for passing around at parties!) but the process is exactly the same. Just cut the halloumi into fry shapes rather than bites! These crispy halloumi burgers are a fabulously easy and delicious veggie burger. I’ve never been much of a fan of veggie burgers, but one bite of one of these and you’ll be a lifelong convert! Crispy halloumi makes this tomato, corn, avocado and basil salad over-the-top delicious! Really crispy fries... but they aren't really fries. They're fried halloumi cheese - with lots of sour cream and sweet chili sauce to dip them in. Mmmm! Recipe inspired by 'halloumi fries' by Oli Baba's posted in the Sunday Times. Note that when calculating the nutritional info for this recipe, I did not include the cooking oil or dips. So please take this information with a grain of salt! *If halloumi is tricky to find where you are, you could use Latin American ‘queso para freir’ instead if you like. Or any hard cheese that you know doesn’t melt easily when heated. I love halloumi, but have never fried it. Yes please! This looks decadent delicious, Helen! Thanks, Marissa! I usually cook halloumi, but I’d never tried it like this before. It was so so easy … so hope you try it! what would you recommend eating as meal with these? Hi Katy! Great question! I usually make these as a sort of mini appetizer before a dinner for guests. They always go down REALLY well and I get requests to make them from my niece and nephew all the time. Oooh, I get so excited when you say you’re going to try my recipes, Jess. Thank you! I am a little bit obsessed with halloumi, and although we don’t have it as fries very often, it is nice as a treat. I totally agree about places never giving you enough sauce. It’s all about the sauce! This one is even better than fried potato wedges! I never had this cheese before but I had something very similar when traveling in Turkey. The texture is great after heating up. Will definitely hunt it down! Helen – these fries do look so darn crispy! I’ve yet to try halloumi – don’t recall seeing it at the grocery stores I frequent – but I definitely need to try this cheese that does not melt! C’est incroyable Helen, on dirait vraiment des frites! Tu sais? 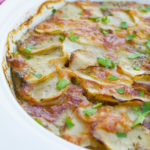 Ici il est presqu’é l’heure de dîner et voir ta recette me fait vraiment envie! C’est une idée très chic! Hi Helen, oh there is nothing like fried cheese, love it! Oh my…oh my oh my….I am literally weak in the knees seeing this…. Oh those fries. Oh those fries. I have a piece of ham that would go sooooo well with those fries. 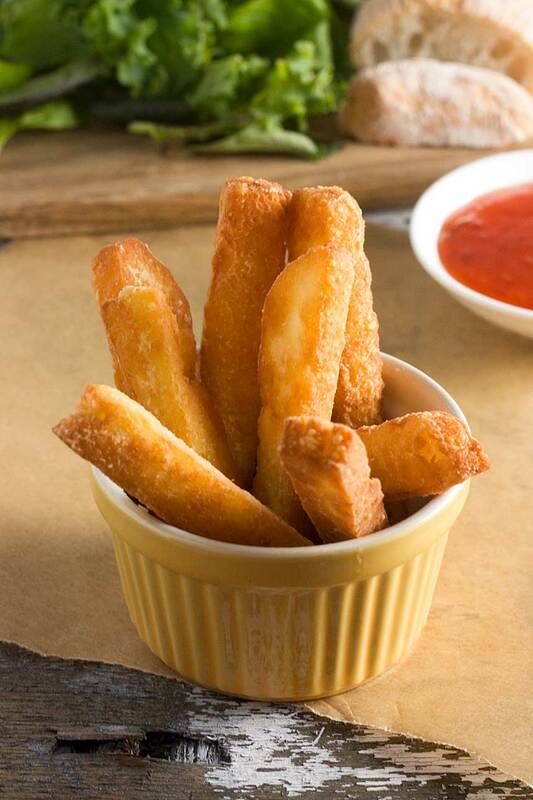 These potato wedges sound delicious, but the halloumi fries will be a great substitute! 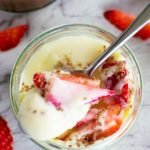 Love them and will definitely try the recipe! Pinning and sharing! A tasty idea making fries with halloumi. They look so crunchy and moreish. Very good idea for a party too! That is all. Need to go lie down in cheese ecstasy. 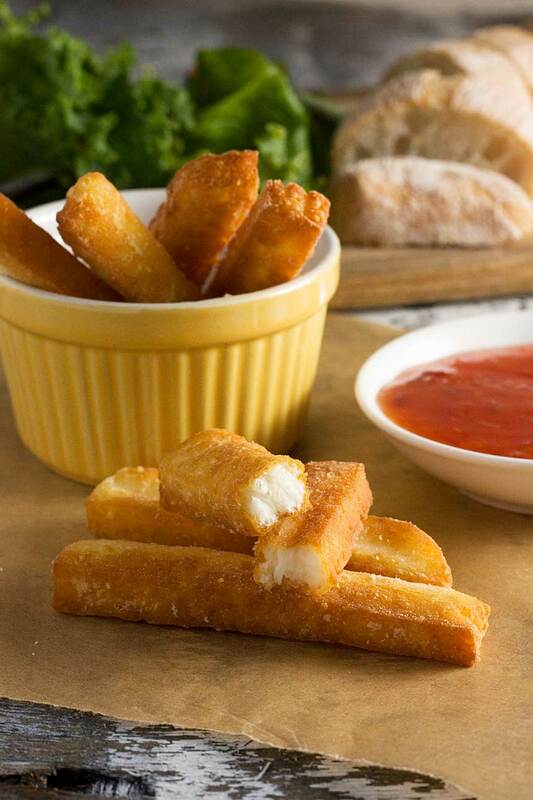 These halloumi fries look fantastic! I have pan fried halloumi, but not French-fry style. These make a great appetizer and much better than potatoes. I hope you do give them a try some time, Sandra. You’ll never look back! Wow, I’ve never thought of that, Richa. If paneer is quite a solid cheese that doesn’t melt easily then I think it would work great! Your recipe is amazing ! Hi Gail – thank you so much. I’m so glad you think so! Have you made it yet? Hi Jacquie! So glad you’re keen to give these a try! I’ve never tried using a different kind of flour but I have a feeling it would work fine. I’d love to know how you get on! Making these tonight, to go with my steak. I’m on a low carb diet and can’t have potatoes. I’ll make some garlic mayonnaise and go to bed very happy indeed. The only thing better than cheese is … cooked cheese … whoop! Hello Fiona! So happy you like the look of these. Great idea to make them to go with a main meal – why haven’t I thought of that before? Did you enjoy them? ?